Facebook will soon have one less weapon in its quest to find additional revenue streams as the social networking giant will shut down Gifts on August 12. You win some, you lose some. Zuckerberg and company introduced Facebook Gifts in September 2012. 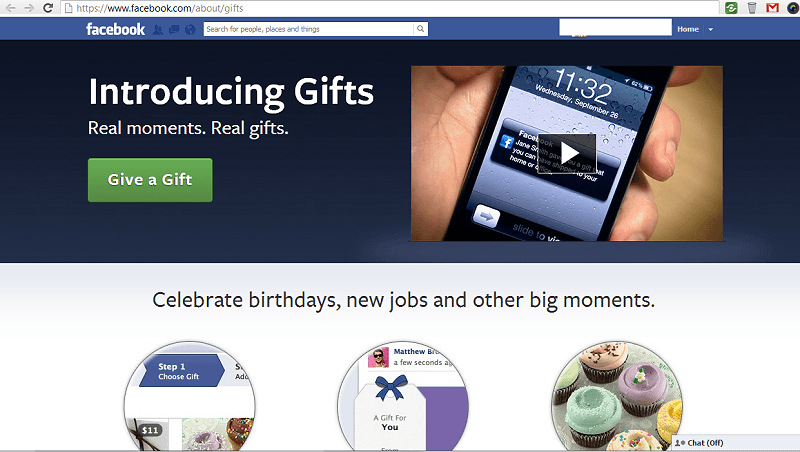 The service allowed users to purchase and send real-life gifts to other Facebook users either through notifications (send a birthday gift, for example) or simply by visiting someone's Timeline. Less than a year later in August of 2013, Facebook announced plans to purge physical merchandise from the online gift store. Instead, they wanted to focus on digital gift codes and the like. Given the company's current e-commerce strategy, however, the service is more or less a conflict of interest. Their official statement to TechCrunch was that they'll be using everything they learned from Gifts to explore new ways to help businesses and developers drive sales on the web, on mobile and directly on Facebook. Most probably saw this move coming, especially in the wake of the new Buy button. Launched just over a week ago, the service allows users to buy products from ads and News Feed Pages without having to leave Facebook. New strategies aside, the shutdown of Gifts also likely tells us that the service wasn't making much money and didn't warrant any further investment in terms of time and money. Facebook noted that no layoffs will occur as most of the Gifts team has already been assigned to other projects.